Our scholars learn about faith in Jesus through classroom instruction, weekly mass and monthly recitation of the rosary. Scholars pray daily and learn the significance of holidays such as Christmas, Easter, the Feast of Our Lady of Guadalupe and more. We also offer our 2nd Graders the opportunity for First Reconciliation and First Communion. 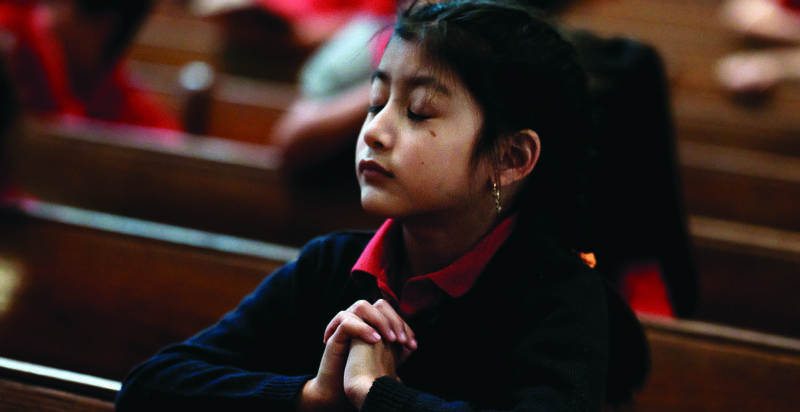 In addition, our host parish Holy Cross offers sacramental preparation and religious education. All are invited to join our scholars and staff at mass on Wednesdays at 3:30 p.m. in the church of the Holy Cross, University Ave and 17th Ave. NE. The scholars fulfill the roles of lector, cantors, and prayer leaders while our chaplain Fr. Kevin Finnegan, pastor of Our Lady of Grace parish in Edina, celebrates the Eucharist. All scholars come together to pray the rosary on one Monday a month. Each middle schooler takes a kindergartener under his or her wing and teaches them how to respect the rosary, what to say and how to act during the prayer. Classes take turns leading a decade. All are welcome to join us for this monthly prayer to the Virgin Mary. We are one of the few Catholic Schools that offers First Reconciliation and First Communion as part of our 2nd Grade program. For students who are not in 2nd grade but are seeking First Communion, children who are seeking baptism, and middle schoolers who are seeking Confirmation, we have a wonderful partner with Holy Cross Church. The church offers a beautiful religious education program on Wednesday nights in Spanish for parents and in English for children.